I miss Robin Williams very much. I find myself still reeling from his death, still wondering what these days would look like if he was still walking above ground. It was a massive heartbreak when I heard he died. When I realized there were a couple more movies to see featuring him, I have been eager to see them. There are still a couple more to see, and it seems these last few movies by Mr. Williams, I have noticed that even after such a long career, we were just seeing how deep his ranges went. "Boulevard" is a perfect example of that. 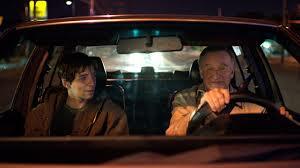 In "Boulevard," Robin Williams plays Nolan. Nolan is a successful banker, who has a loving wife. It seems Nolan has hit the jackpot, it seems he has the perfect life. But something about him seems sad, like there is something secretly eating away at him and he can't seem to figure it out. His father is in the hospital, but we can't tell if that is truly it. There is something that is unfulfilled about him, and we can't figure out what. We see Nolan driving down a road he's never been down before and he almost hits Leo (Roberto Aguire), Leo seems like a normal kid and Williams feels terrible about how everything happened, and he offers a ride for Leo. We then learn a powerful secret about Leo, and even though Nolan is married, he's mysteriously drawn to Leo. Nolan finds himself going to Leo to just hang out. That's all, yet he feels guilty not telling his wife about him, but he can't stop himself from visiting him every night. "Boulevard" is a movie about discovering who you truly are. Its a movie about finding out that no matter how perfect your life is, if you are not who you truly aspire to be, you will never find happiness. Its also a movie where a man discovers just how far he is willing to go in order to find that happiness. This is not at all a role I would ever imagine Robin Williams playing, and he plays him well. Sure, Robin Williams has played good dramatic roles before, but this is absolutely nothing like anything he's done before. Its a role like this absolutely kills me Williams is not of this world anymore. The rest of the cast is pretty solid. Aguire is a true discovery here. He has great chemistry with Williams, as they share about 80% of the films screen time with each other. He puts a very human signature on his role and he helps the audience buy into the presence. Bob Odenkirk shows up as Nolan's best friend and I liked him here. Odenkirk usually is pretty funny, but he does really good serious work here. The movie itself is pretty pedestrian though. The entire movie hinges on this relationship between Nolan and Leo, and its pretty clear what Leo wants from this strange relationship. Its never really discussed what Nolan wants, but a twist within Nolan's wants and needs is kind of paved over quick. I wish it was more explored, and it didn't just happen. This was the pinnacle of the movie's story, and they pushed over it like it didn't matter. That kind of bothered me. But still, it was a movie that kept me guessing. Its always a fun experiment to watch a movie only by name, and overall this experiment paid off.